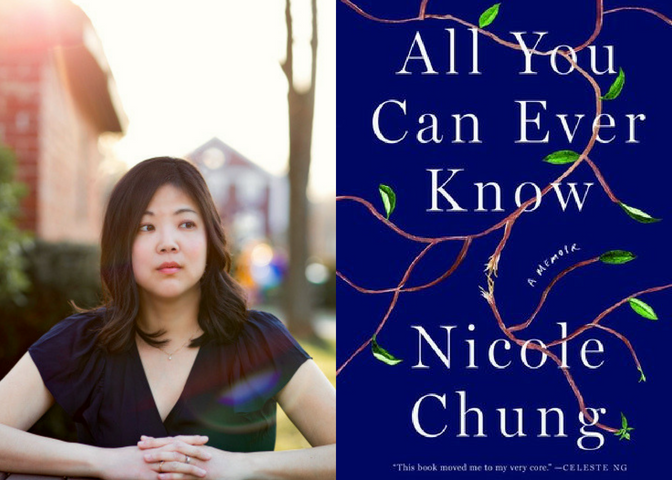 Lily Rugo, Kundiman's Spring 2018 Communications Intern, interviewed Nicole Chung about her forthcoming book "All You Can Ever Know," which will be published Oct. 2, 2018. Preorder her book here. I cannot wait for your book, All You Can Ever Know, to come out this year. I’ve read your essay about your adoptive parents reading it, and have followed its journey on Twitter. When did you become comfortable sharing your own adoption story? I started writing no-holds-barred essays about adoption in my mid-twenties. It was an experiment; I had no intention of ever publishing the pieces. I showed them to half a dozen people at most. It was so hard for me to just get it down, but then my readers seemed to understand so much more than I’d ever have expected them to. Later, in graduate school, I began writing more about adoption and what it’s meant within my various families—I was thirty, thirty-one at that point. When I started to actually pitch and publish essays on the subject, I was surprised again when they appeared to strike a chord. People seemed to want this perspective I had not often seen represented in the mainstream—and some fellow adoptees even shared that it helped them feel seen. That’s probably what made me return to that well whenever I felt I had something to say. I did and do still get negative feedback, too, but the positive far outweighs any criticism, and so I’ve continued to share my story—and stories by other adopted people—because I do think our voices need to be among those leading these conversations. I think about these lines from your editor’s letter from Catapult’s Adopted essay series all the time: “And yet so many of the adoptees I know today are natural storytellers. I sometimes wonder if this is because we never had a choice.” What led to that realization that adoptees “have been explaining our lives, our families, and our histories for as long as we can remember”? Growing up, I was asked so many questions about adoption—how my parents got me; why I didn’t look like them, etc.—that I think I’ve always had to be able to talk about it, even if I wasn’t 100% comfortable doing so. Which is not to say I told people the full truth; I knew I was holding a lot back when I answered questions as a kid. I was always representing, whether I liked it or not, because the transracial aspect of my adoption just made it so visible to others, and it was exhausting. Dealing with racism and stereotypes and other people’s assumptions was exhausting. Every time I got a question I would offer these pat, rehearsed explanations, sometimes without even thinking. I’d tell “my” story, but it was really a story other people had kind of made up—with the best of intentions!—and given to me so that I could understand something incredibly complex and nuanced in the simplest of ways. So I could talk about adoption from an early age, but I also felt like I had to appear as happy and well-adjusted as possible; not just for my adoptive family’s benefit, but so that other people wouldn’t judge and find me lacking. As a result, I told some stories that were true, and I told some stories I knew people just wanted to hear, and I told some stories intended to soothe or head off racism or make me appear “normal.” Only in my twenties did I begin to recognize that I’d always felt pressured to be this kind of spokesperson for transracial adoption, as a visible Asian adoptee in white spaces, and what’s more that I’d been guilty of not making enough room for its complexity, either—exactly what had so often frustrated me when talking with other people who didn’t seem to understand it well. I realized that even if no one else was hungry for a different kind of adoption narrative, one that centered adoptees’ experiences and made room for all the complication and all the loss as well as all the good, I needed that sort of narrative to exist. And so I decided that from then on, when I talked about race and adoption, I was just going to say what I really thought. I really appreciate you being one of the most open writers writing about transracial Asian American adoption. When you talk about adoption and share your story, how do you write about a topic important to you, and at the same time avoid becoming “the adoption writer”? The same way anyone tries to avoid being pigeonholed, I think—just by doing a lot of other things! Many of my most widely read pieces aren’t about adoption at all. Usually the first thing I want to do after writing a deeply personal essay is get out of my own head and write about someone else—I love to talk to interesting people, so I do a lot of interviews. I’ve also been a full-time editor for several years, at The Toast and now at Catapult, so in any given week I might be far more focused on my writers’ work than my own. I tend to write about one adoption piece per year now, though it used to be more. Sometimes I joke that after this book, I won’t write about it ever again. But the truth is it will always be there in some fashion, whether I name it in my work or not; it is a part of me, and always will be. I will always care about and want to edit and publish adoptees’ stories, for sure. We’re written about so often—we should be looked to as the authority on our own lives. I hope that once my own story is out there in full, with this memoir, it encourages other adopted people to think about and define their own experiences. I will continue publishing those stories—I really hope to edit an anthology eventually. To the extent that some readers might associate me mainly with adoption, or think of me as an “adoption writer,” I hope it’s because my essays or my book offered a perspective they might not have fully considered before, and then inspired them to seek out the voices of other adoptees.